I adore felt crafts. 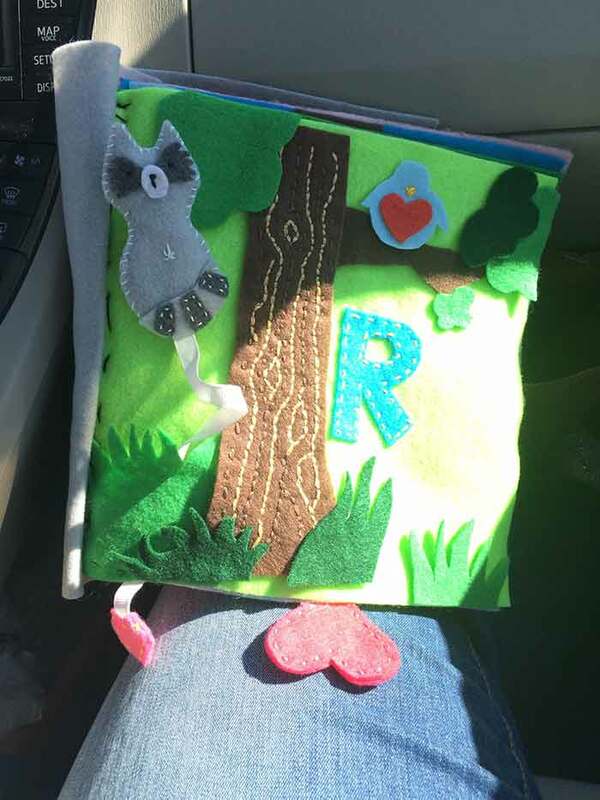 I’m working on a project of felt fruit presently, but when my niece was 18 months old I made a quiet book using the letters of her name as inspiration for each page. 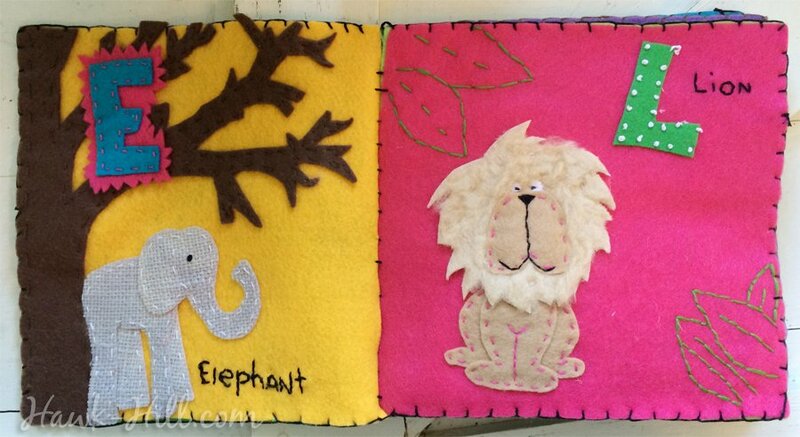 A combination of craft glue and hand stitching created an interactive book of activities and textures. 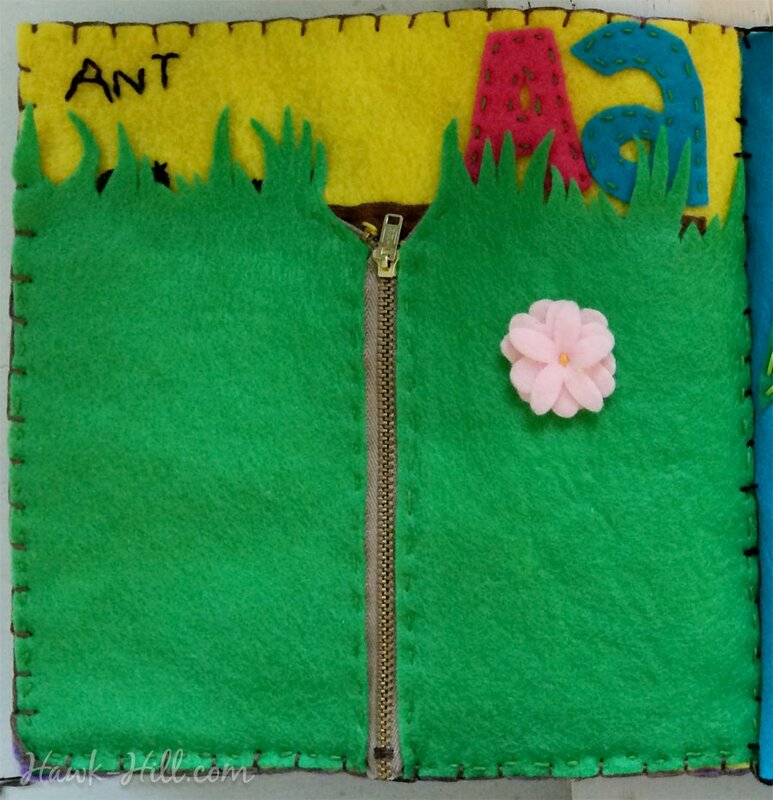 Alphabet “A” Felt Book Page: The ant page was one of my favorite (and a perfect gift from an “aunt”!). I made my aunt farm using a scrap of brown towel (for “dirt”) and a covering of green felt grass. 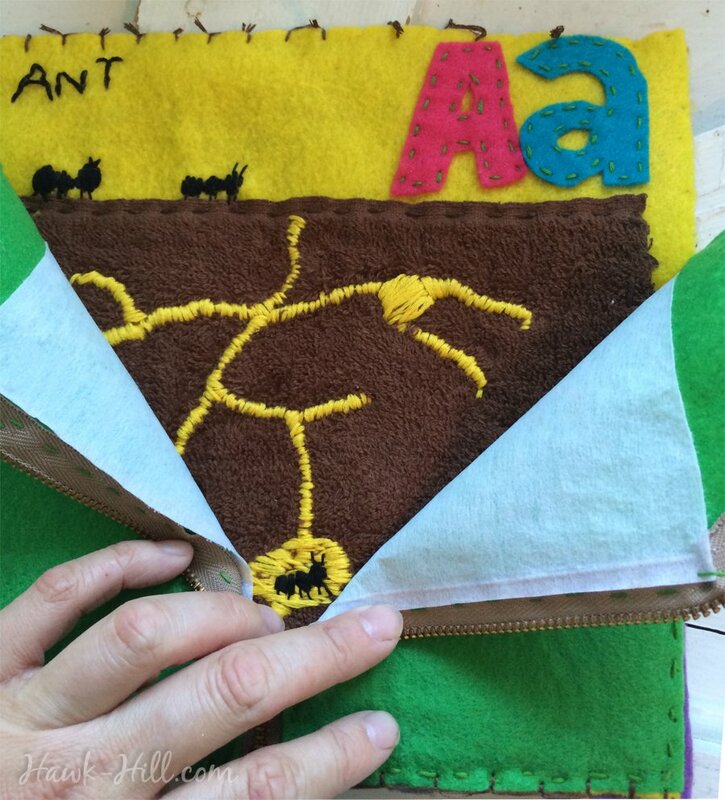 I embroidered the ant tunnels and ants on the brown towel, stitched it into place, then placed a zipper on the grass so my niece could unzip the grass to see the bugs underneath. I reinforced the felt with interfacing since I didn’t think it would be sturdy enough to hold a zipper very long on its own. 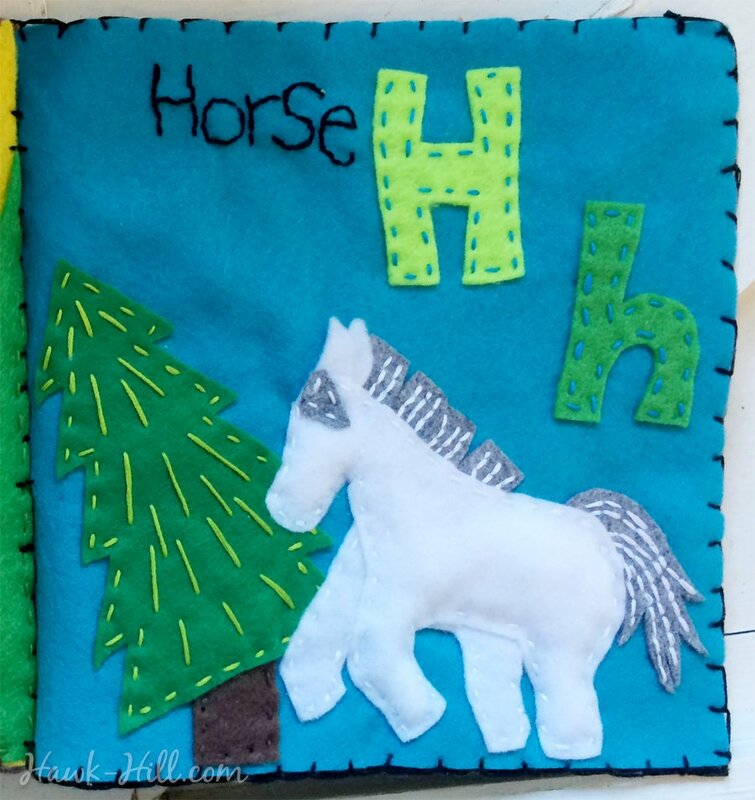 Alphabet “H” Felt Book Page: The horse page was one of my simpler designs. 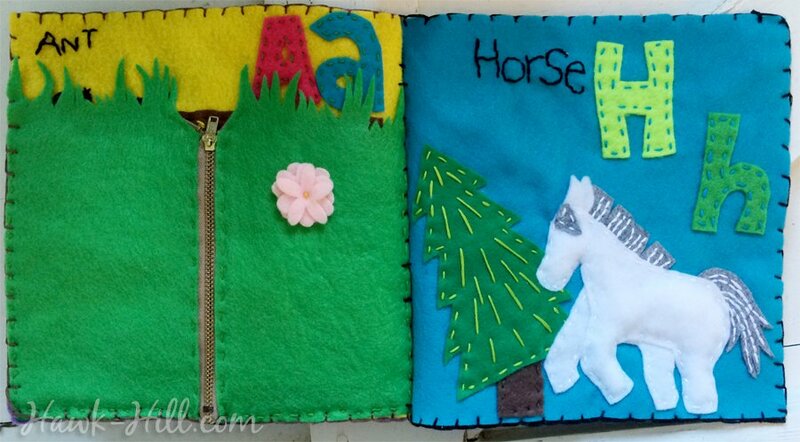 Layers of felt created dimension behind my horse- and a little extra stuffing (stuffed with snipped up scraps of felt) made him 3-D. 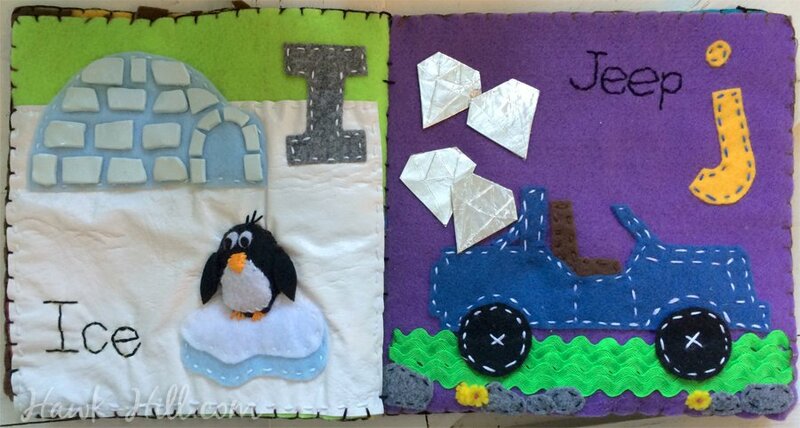 Alphabet “I” Felt Book page: I was definitely one of my favorite pages to make and show my young niece! A scrap of thin white vinyl formed the slipper ice texture of the background. Layered felt blobs formed a little iceberg on which a penguin sat. This page has a surprise: a dog toy style squeaker stitched inside Mr. Penguin. Poking his belly makes him squeak- my niece loved this! 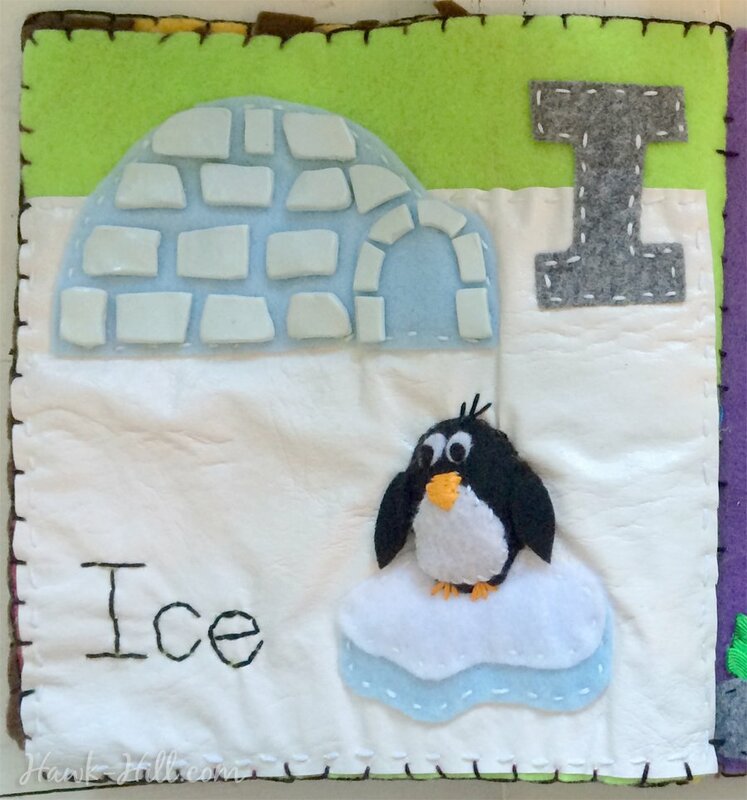 Building an Igloo for my felt book “I” page: I could have cut ice out of felt for my igloo, but I loved the idea of creating lots of textures for my young niece to explore. So I formed flat “bricks” out of Polymer Clay, baked it to harden, and attached each ice block with a generous amount of super strong adhesive. 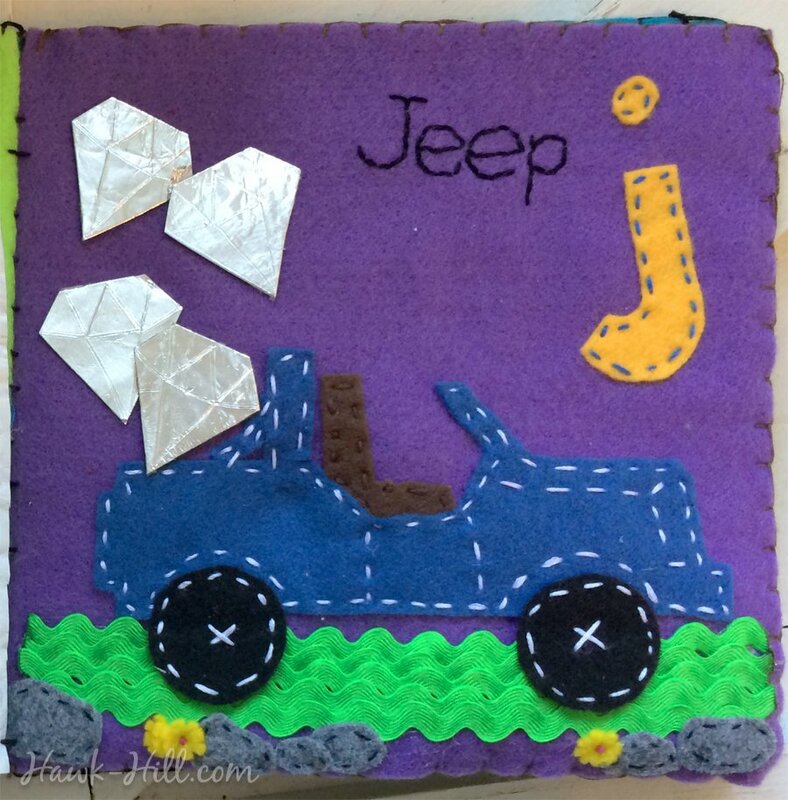 Alphabet “J” Felt Book Page: My “J” page features both Jeeps and Jewels, on a road of rick-rack. Again with J, I chose an alternative material for the sake of texture and cool appearance. I created my jewels by placing a piece of heavy duty aluminum foil on a safe surface, covering the foil with a generous amount of hot glue, then placing another sheet of heavy aluminum foil over it and quickly (and with hands well protected from the heat) smoothing the glue between the two layers of metallic foil. As the glue hardened I traced lines into the top sheet of aluminum foil to illustrate the gem shape. 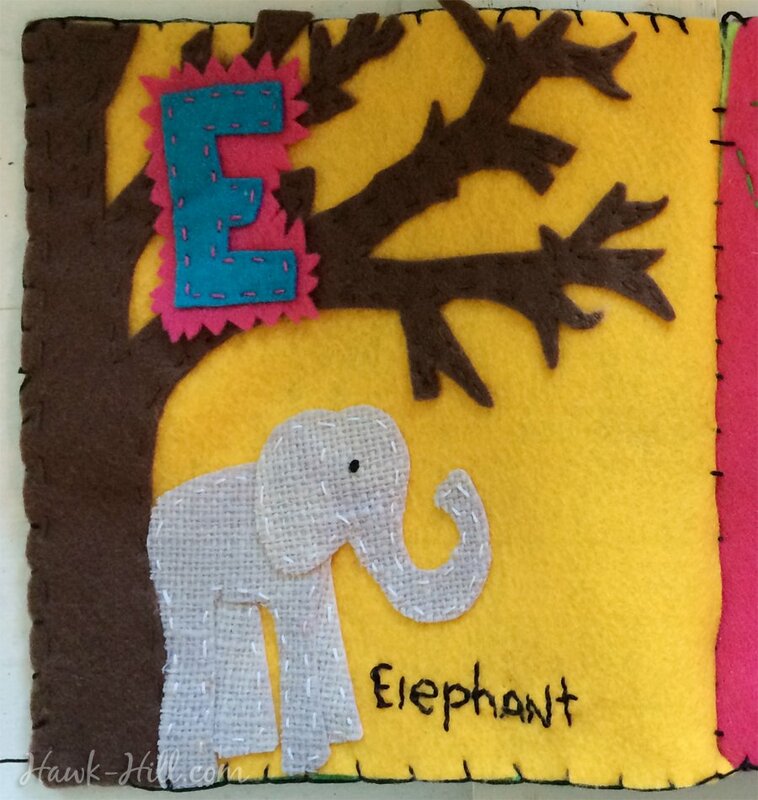 When completely cool, I used scissors to cut my gem out of the layered foil and glued to the felt book’s page. 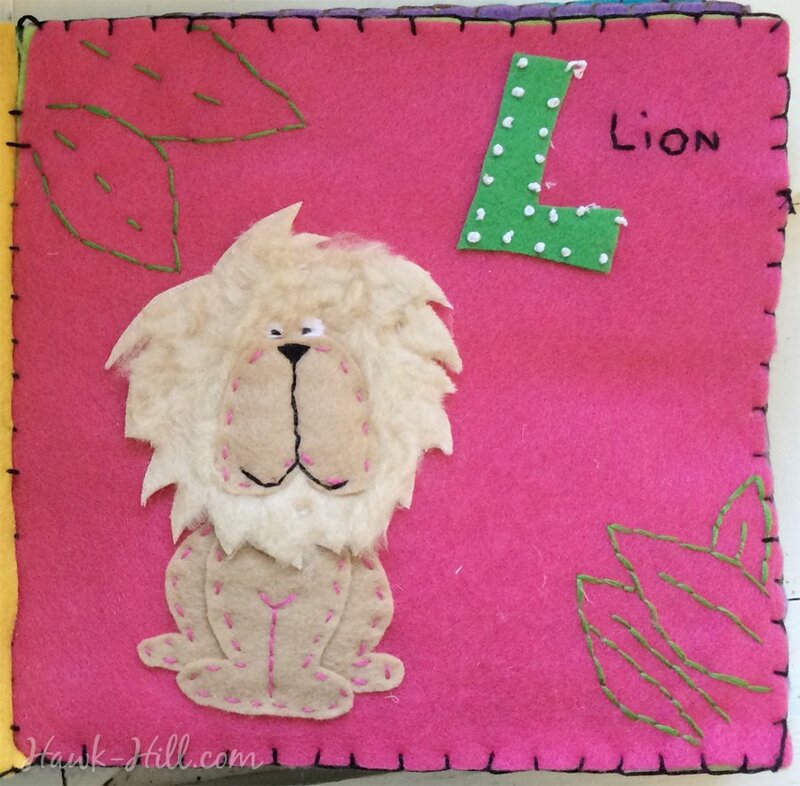 Alphabet “L” Felt Book Page: Lion was created with a very similar method to Elephant- again layering fabrics and textures to create a 3-D look. I used a scrap of acrylic fur for his shaggy mane- and again used tons of Fray Check to keep the backing of the fur from unraveling- especially at the tips. Alphabet “R” Felt Book Page: Racoon and Robin illustrate my “R” page. The photo above was taken as I was about to stitch the bird onto the tree branch. 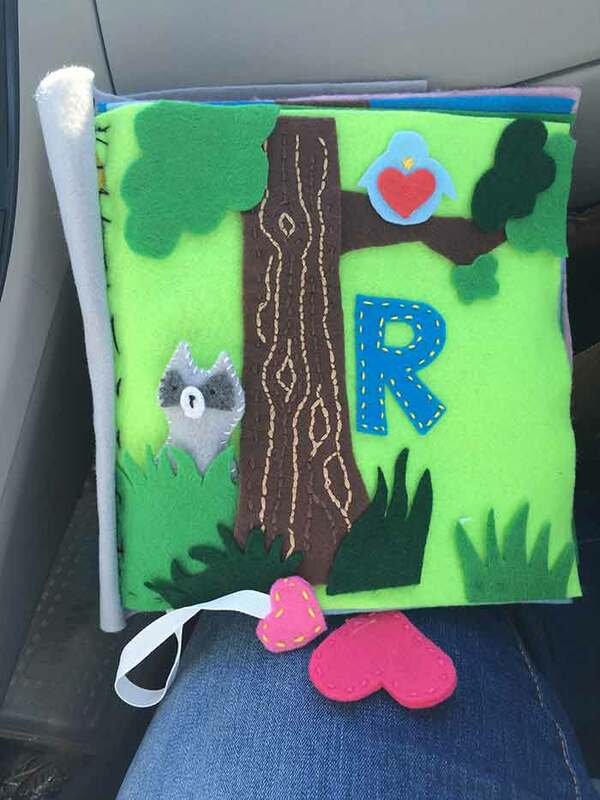 In this woodland layout, the racoon pops out of his hiding place in the grass and is connected via a stitched grosgrain ribbon so he won’t be lost. The ribbon pull also makes it easy to nestle him back into his grassy cubby. In the photo below, you can see my simple racoon and how he is stitched into the woodland page of my quiet book. Y was a hard page to design a layout for! Not very many fun toddler-level words start with Y. I ended up with “Yeti”- mostly chosen just because I knew he could be cute. 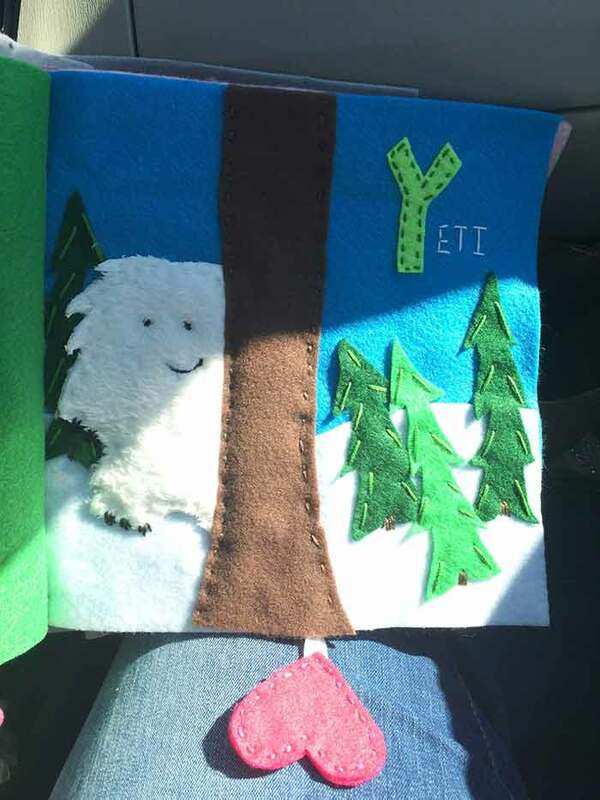 This page is less interactive, but I used an extra fuzzy fabric for the Yeti’s body, providing texture stimulation for the young reader. Again, liberal amounts of Fray Check were used to keep his pillowy fur in place.